Substation hardened, the Multilin™ C650 has been designed to provide control, monitoring, and automation for a wide range of applications including bay control and monitoring in electrical substations. With high-density I/O capable of supporting up to 192 programmable digital inputs, the C650 can also be used to extend the I/O capability of new or existing protection and control relays. With powerful and deterministic programmable logic, advanced communications and metering capabilities ,the C650 is flexible, cost-effective and reliable solution for substation control. 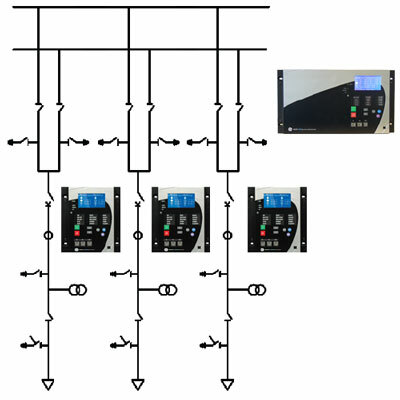 For substation automation implementations, along with high density I/O, the C650 provides high speed control functions including four-shot autoreclose for three-pole tripping schemes, and synchrocheck for circuit supervision. Advanced automation capabilities enabling switchgear interlocking applications. 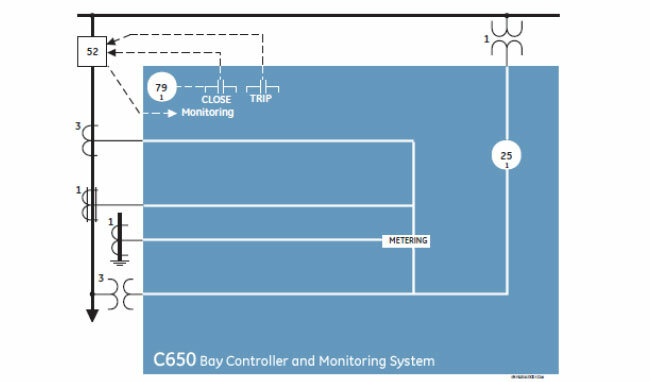 The C650 incorporates advanced automation features that replace multiple devices with a single unit and includes powerful programmable logic, communications, and SCADA capabilities that far surpass what is found in the average controller relay. The C650 provides seamless integration with other GE Multilin devices for comprehensive system automation and control. 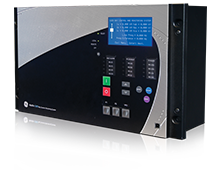 The C650 offers a variety of different I/O configurations based on user’s need. A choice of 16 to 192 inputs and 0 to 48 outputs are available. Digital inputs may be user defined with a separate debounce and chatter time. Programmable “quasi“ analog input levels allow the use of different voltage levels in the same model via setting the requested thresholds. EnerVista software allows easy configuration of all the interlocking and switching sequences. A graphic HMI interface provides access to monitoring, metering and alarm panel screens. Use virtual inputs and outputs in conjunction with the programmable logic capabilities of the C650 for unusual applications involving interlocks, blocking, or supervisory functions, to minimize the requirement for auxiliary components and wiring while making more complex schemes possible. The virtual inputs and outputs are digital signals associated with the C650 internal logic. Virtual inputs include signals generated remotely via communications. 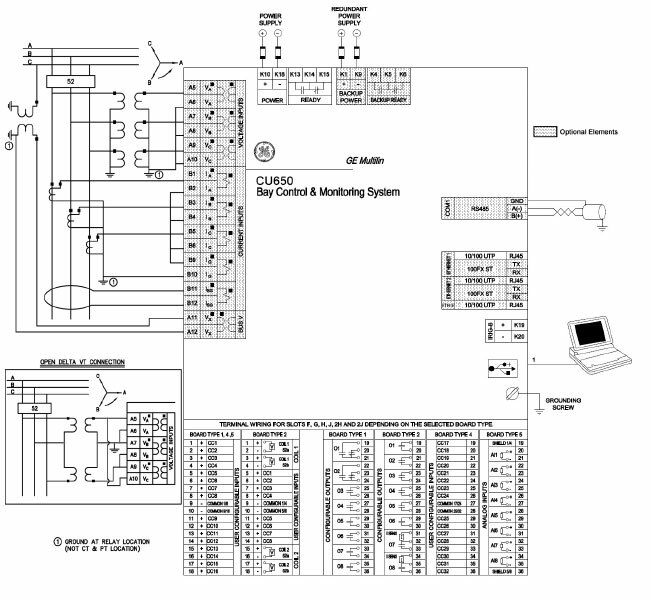 The virtual outputs are outputs of programmable logic equations used to customize the device. Virtual outputs can also serve as inputs to programmable logic equations. dcmA inputs are available to monitor system parameters such as temperature, vibration, pressure, wind speed, and flow. The remote I/O feature provides a means of sharing digital point state information between C650s or other IEC61850 compliant IEDs or controllers. The remote outputs interface seamlessly to the remote inputs of other C650 devices via the IEC61850 GSSE messaging. User secure peer-to-peer communications to develop complex schemes in distributed logic and I/Os. The C650 incorporates industry-leading communication technologies making it one of the easiest and flexible feeder protection relays for use and integration into new and existing infrastructures. The C650 provides optional Parallel Redundancy Protocol (PRP), High Availability Seamless Ring (HSR) (IEC 62439-3) and also Rapid Spanning Tree Protocol (RSTP) (IEEE 802.1D) to increase network availability and reliability for critical applications. The C650 provides integration with 61850 standard edition 2 devices. IEC 61850 allows for the seamless connection of IEDs from multiple vendors. In addition to device interoperability, these protocols are designed to control the substation via a LAN instead of through discrete wiring to an RTU. 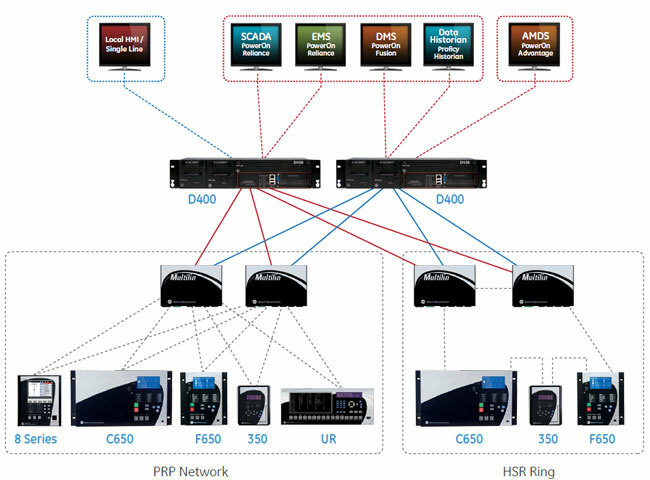 Redundancy protocols can be used for various networking architectures including combined PRP / HSR technologies. The EnerVista Suite is an industry - leading set of software programs that simplifies every aspect of using the C650 relay. The EnerVista suite provides all the tools to monitor the status of your the protected asset, maintain the relay, and integrate information measured by the C650 into DCS or SCADA monitoring systems. Convenient COMTRADE and Sequence of Events viewers are an integral part of the 650 Setup software included with every C650 relay, to carry out postmortem event analysis to ensure proper protection system operation. 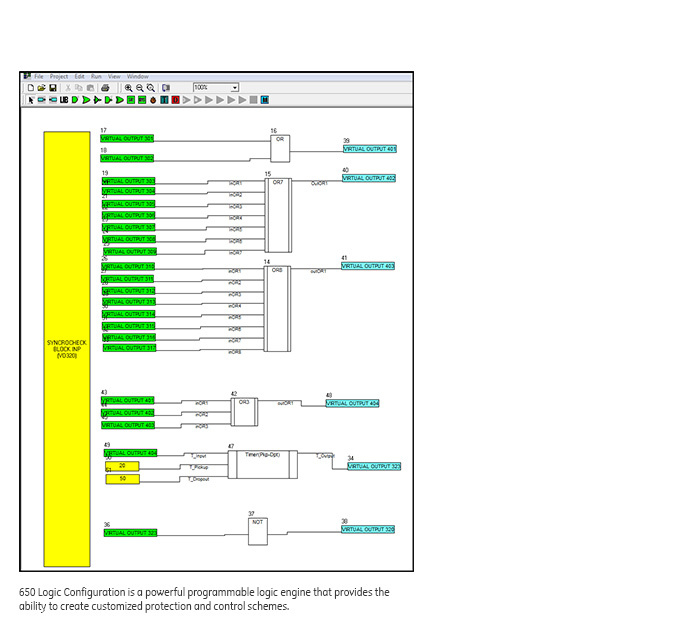 C650 Logic Configuration is the powerful programming logic engine that provides the ability of creating customized protection and control schemes thereby minimizing the need, and the associated costs, of auxiliary components and wiring. The C650 is offered in two form factors, a full 19” rack-mount version and a ½ rack version. 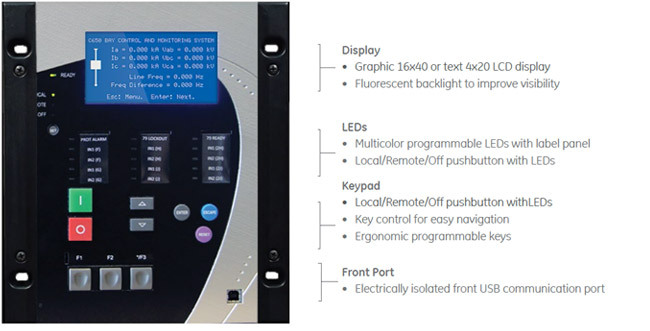 A choice of text or graphic display, and up to five configurable keys are available for frequently performed control functions. Up to 15 programmable LEDs are available. The C650 can incorporate (option “N” for the second position of the ordering code) a Graphical display with IEC Symbols.